THE BEST TIPS FOR USING INSTAGRAM LIVE + FREEBIE DOWNLOAD! Instagram Live was a big and exciting update back when the feature was first announced, and we are sure you’ve noticed many of your favourite Instagrammers using it. It is such a great way to reach your followers and really bond with your audience, and it allows them to interact with you live. This gives them a whole new level of communication, and Instagram Live is a huge factor in building your tribe. Yet, there are still many (maybe yourself included) people who never use Instagram Live, for one reason or another. Some say they are too nervous, others get proper stage fright, and some say that they wouldn’t know what to talk about. We think Instagram Live is so great, and want everyone to feel comfortable enough to do it. Therefore, we wanted to share this blog post with our favourite ways to use Instagram live, and we have even included a freebie for you to download! 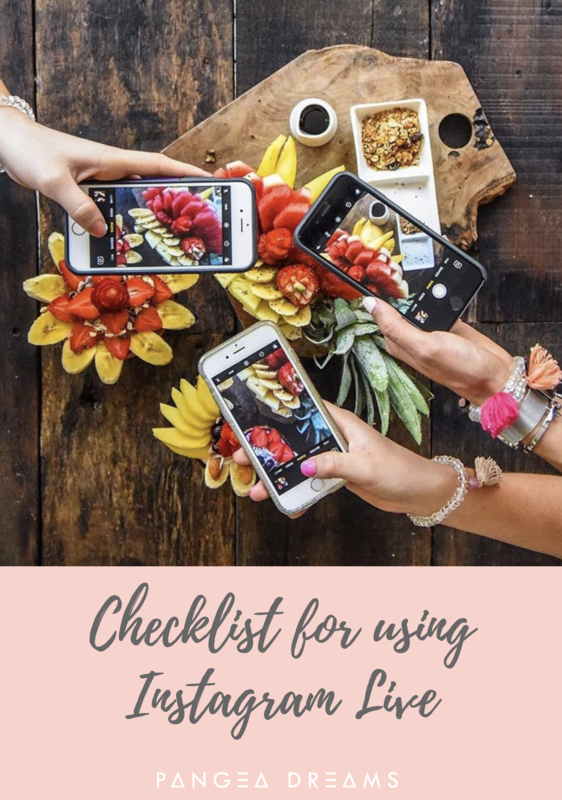 Just scroll to the bottom of the post to join our email list and claim your free download, a checklist you can use for Instagram Live! Going Live on Instagram should be nothing but a fun and exciting way to connect with your followers, so read these ways to use Instagram Live to make it just a little bit less scary for you! If you are planning to go Live on Instagram, make sure your followers know about it. Tell them in the caption of your post, tell them in your stories, and even ask them for topic suggestions in advance! There are lots of ways to get your followers involved and excited about your Live, and this will lead to more of them showing up when you are Live. Make sure to post on your stories several times in the days leading up to your Instagram Live, sharing the exact date and time for your Live. Then, post a reminder 4-6 hours, 2-3 hours, 1 hour and 15 minutes before you go Live. You’d be surprised with how many people will only notice one of those stories! Also, announcing the topic of your live in advance, and even allowing your followers to give suggestions or vote on what you should be talking about during your Live, will make them all much more eager and more likely to tune in. We know most people avoid going Live because they are nervous, and don’t feel like they have anything to talk about. So prepare yourself for your Instagram Live by writing down what you want to talk about, saying the topic out loud a few times, and reminding yourself that it’s nothing to be worried about. You are just going to talk to people who are already watching your stories and reading your Instagram captions. They already love your voice and follow you for it, so there is no reason to be nervous. We cannot stress this enough. Be yourself during your live, and do whatever comes natural to you. If that means telling your followers that you are incredibly nervous, or pointing out that English isn’t your first language; just do it. If that means asking them for advice on what to talk about because you are running out of ideas, then do it. Like we said; they already follow you and like what you share, and they are just as excited to see you Live as you are to be going Live. This is a tip that will make planning your live (and not getting too nervous) a lot easier. Many people avoid using Instagram Live out of fear that they won’t have enough to talk about, or not enough topics. But that’s not a bad thing! Seriously, have you ever watched a Live where the Instagrammer spoke for 1,5 hours talking about 15 different things? Chances are, you haven’t, and even if you have, we are sure you wouldn’t have enjoyed it. An Instagram Live isn’t supposed to last forever, and no one is expecting you to go on for much longer than 10-15 minutes either. So, just pick your 1 topic (maybe two), and plan a few pointers for yourself to talk about. Then, allow people to ask questions in the comments, and answer them as you go on. Once you get talking, we promise you’ll forget how nervous you were, and you’ll start enjoying yourself. This is a bit of a pro tip that we promise will help you ease into your Live. Before you start, write down 1-3 questions about your topic and put them aside. Then, if you get to the point where you feel as if you are running out of things to talk about during your live, pick up your note and say that you wanted to answer a couple of questions as well! Then, read the questions one by one, and answer them! Hopefully you’ll already have gotten a few questions from your followers during your Live, but this is a great way to keep the ball rolling if they haven’t asked any yet. And, once they see you answering questions, they may feel as if they can ask theirs. Do you think it’s scary to go live? Tell us your thoughts in the comments below!